Madd Recovery dba Bulldog Recovery is fully licensed, bonded, and insured. 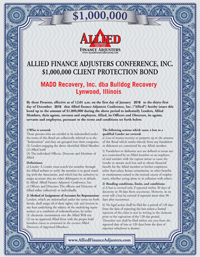 We are proud members of Allied Finance Adjusters and are covered by their $1,000,000. Client Protection Bond. Through Allied Finance Adjusters we stay involved and educated in all repossession industry compliance regulations, and ensure our CFPB compliance. 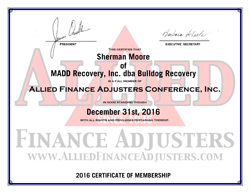 Madd Recovery dba Bulldog Recovery are Certified Asset Recovery Specialists through the completion of the CARS training program. This program consists of sections covering the Asset Recovery Industry, Skip Tracing, Ethics and Communication, Defensive Driving and Tow Truck Operation, and Insurance Coverages critical to these operations.